Just imagine you get into your car and it recognizes straight away what mood you're in, probably quicker than your spouse." 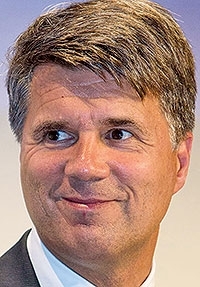 MUNICH -- BMW CEO Harald Krueger said the breakneck speed of technological advances is giving automakers new rivals such as Tesla but also new opportunities in areas such as artificial intelligence. "Until very recently our competitors were Mercedes, Audi and Porsche," Krueger said. "Now we are looking at newcomers such as Tesla or Faraday Future -- who knew these companies 10 years ago? -- and of course high-tech players like Google, Apple, Baidu or Alibaba. "It shows how our industry is changing," he said last week in a keynote speech at the Automotive News Europe Congress here. 1. The victory in March of Google's AlphaGo software program over Lee Sedol, the world's best player of Go, a Chinese board game that is infinitely more complicated than chess. "This win for artificial intelligence marks a historic turning point," Krueger said. "AlphaGo is partly based on deep learning neural networks and it made moves that human professionals first saw as errors. The program found a way to win never discovered by humans in 25 centuries of Go history." 2. Pepper, the Japanese humanoid robot that is programmed to be a personal companion for senior citizens. The robot can analyze human emotions and adapt its responses. If you're happy, Pepper will share your joy. If you're sad, Pepper will comfort you. This demonstrates that technology is becoming human, Krueger said. "Just imagine you get into your car and it recognizes straight away what mood you're in, probably quicker than your spouse," he said. BMW's Vision Next 100 self-driving concept already showcases such advances. "The companion in the Vision Next 100 car is just that: a real companion that gets to know you as a person and responds to you as an individual," Krueger said. "I firmly believe this is not a threat to us. It's much more a huge opportunity to all of us -- [mobility] will be effortless, available on demand and tailor-made for all our customers' individual needs." BMW is hiring experts in machine learning and artificial intelligence as it develops the Vision Next 100 into a flagship production model, the iNEXT, due to launch in 2021. The company said in March it was shifting its strategy to focus on electric vehicles, automated driving and new services in the field of premium individual mobility.